Teterboro is the oldest operating airport in the New York & New Jersey Metropolitan Area. Walter C. Teter acquired the property in 1917. During World War I, North American Aviation operated a manufacturing plant on the site. After the war, the airport served as a base of operations for Anthony Fokker, the Dutch aircraft designer. The first flight from the present airport site was made in 1919. During World War II, the Army and Air Force operated the airport. The Port Authority purchased it on April 1, 1949 from Fred L. Wehran, a private owner, and later leased it to Pan Am World Airways, and then to its successor organization, Johnson Controls for 30 years. 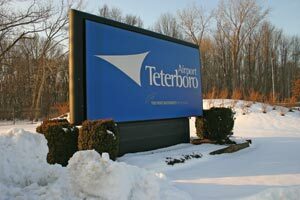 The Port Authority assumed full responsibility for the operation of Teterboro on December 1, 2000. Since the 1950s, Teterboro Airport has been creating large economic benefits and job opportunities in the local community. Since 1970, the Port Authority has invested $174 million dollars to upgrade the airport's facilities and open new areas of service to the aviation community. Teterboro Airport is located in the Boroughs of Teterboro, Moonachie, and Hasbrouck Heights in Bergen County, New Jersey. It is 12 miles from midtown Manhattan, via the George Washington Bridge or Lincoln Tunnel. Nineteen hangars on the airport have a total area of approximately 412,000 square feet. Two large office buildings centrally located, one at 90 Moonachie Ave and the other on Fred Wheran Drive, which houses the Department of Homeland Security. Both buildings occupy a total area of 133,418 square feet. Additional office and shop space with a total area of 165,611 square feet. An operations building, maintenance facility and two fuel farms. CONTROL TOWER - The control tower was constructed on the east side of the airport by the FAA and went into operation on October 29, 1975. Runway 6-24 is 6,015 feet long and 150 feet wide, equipped with High Intensity Runway edge Lights (HIRL). Runway 6 approach has an Instrument Landing System (ILS) and a Medium Approach Lighting System-R (MALS-R). Runway 24 approach is equipped with both VASI (Visiual Approach Slope Indicator) and REIL (Runway End Indentification Lighting) systems. Runway 1-19 is 7,000 feet long and 150 feet wide, equipped with HIRL. Both runways 1 and 19 are equipped with REILS systems. Runway 1 approach is equipped with a VASI system. Runway 19 approach has an ILS. Runway 1-19 was overlaid and grooved in the summer of 2000, and included the installation of centerline and touchdown zone lighting. Runway 1 is the preferred runway for noise abatement procedures. TAXIWAYS - Approximately 4.2 miles of taxiways exist on the airport. Most are 60 feet wide and many are equipped with centerline lighting systems. Another critical step in our quest to identify and develop innovative improvements to improve safety at Teterboro Airport includes the installation of the Engineered Materials Arresting System, or EMAS. This technology, which was pioneered by the Port Authority and the Federal Aviation Administration, is comprised of beds of specially designed aerated cement blocks. These blocks crumble under the weight of an aircraft enabling a plane to stop safely and quickly in the event of an emergency. The first installation on the north end of Runway 6/24 was commissioned in October 2006. Another EMAS installation is planned for the south end of Runway 1/19, and will take place after the relocation of a local street.